1913, 10¢ orange Panama-Pacific, o.g., never hinged, rich radiant color on bright fresh paper, remarkable centering within evenly balanced margins all around, a Superb gem; with 2015 P.S.A.G. Graded certificate (100, SSV $3,750 for 98). 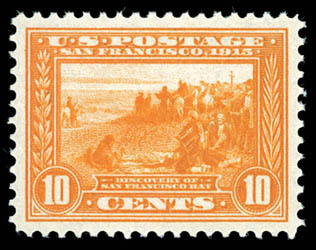 A EXCEPTIONAL PRISTINE NEVER HINGED 10¢ PANAMA-PACIFIC PERF 12 ISSUE.